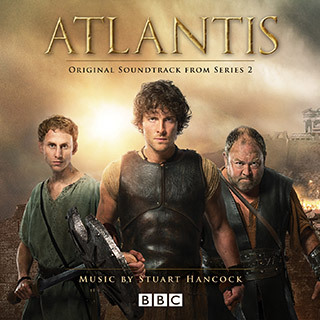 Stuart Hancock’s lush score to BBC ONE’s thrilling fantasy action series. Starring Jack Donnelly as Jason, Mark Addy as Hercules and Robert Emms as Pythagoras, the cult series was created by Johnny Capps and Julian Murphy (Merlin) and Howard Overman (Misfits, Dirk Gently). The show follows the three main protagonists battling against Greek Gods and monsters. The series aired between 2013 and 2015 in the UK on BBC and in the U.S. on BBC America. For the show, composer Stuart Hancock has penned 500 minutes of music to accompany a colourful mix of Greek myths, heroes and monsters. This original soundtrack album features music selections from the show’s second season. Winner of the 2013 Jerry Goldsmith Award, Stuart Hancock is a versatile composer with a long list of film productions (One Night In Turin, One Week – Buster Keaton – new score, Gin and Dry), TV shows (London’s Burning, Creature Comforts, This Morning) and advertising campaigns (Burberry New York, the BBFC, Agent Provocateur, Camelot). Stuart is also known as a concert hall composer and in 2014 his Snapshot Songs, a new song cycle for performance with full choral and orchestral forces was premiered at the Barbican Hall. Stuart Hancock’s scores for short film Hawk and animation The Last Belle have received critical acclaim. The score for The Last Belle was described by Movie Music Mania as “a compact work of pure, distilled charm”, whilst Soundtrack Geek comments on the Hawk soundtrack being “a wonderful listening experience”. 6 What Is It We Fight For? 10 Who Is To Blame?